At Jubilee Labradoodles, we know the importance of keeping a dog healthy and happy. In addition to regular professional veterinary care, each of our labradoodles is monitored and maintained to watch their health. We know that as soon as you take your new family member home, his or her health will be a top priority. Watching your new pup for ear infections is just one of the many parts of ensuring the health of your labradoodle. Ear infections are common in all dogs and are something that your pup will probably experience at least once in his or her lifetime. In addition to redness and swelling, you may smell an odor coming from your dog’s ear. Other symptoms include scratching and rubbing at the ears and head shaking. If you notice any of these symptoms, it’s best to take your dog to the vet for a diagnosis. The most common cause of ear infections in dogs is the growth of microorganisms in the ear canal. Bacteria, yeast and ear mites are other specific causes of this uncomfortable problem for pups. According to Cesar’s Way, dogs that suffer from allergies can be predisposed to ear infections. Moisture from bathing or swimming can also help foster bacterial growth in the earl canal. 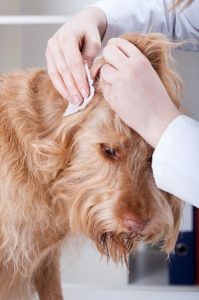 To avoid infection, it is best to clean the ear after grooming or swimming/bathing, anytime the ears may have gotten wet. Your dog’s ear will be sensitive from the infection, so it is best to use a gentle cleanser when removing debris from the canal. Avoid using ear swabs, rubbing alcohol and other irritating solutions, as these could cause injury to the ear drum or push material further into the ear. To start, fill the ear canal with a cleaning solution that has a drying agent. Next, put a cotton ball lightly in the ear and massage the ear at the base to help move the liquid. The cotton ball will hold the liquid in place and grab the debris from the ear. Repeat the process until the cotton ball emerges fairly clean. Once the canal is dry – approximately 10 minutes – add veterinarian-prescribed drops or ointments. Don’t forget to schedule and attend check-ups with your vet to be sure the infection has cleared. Depending on the severity, a treatment regiment may last a few days or as long as weeks. At Jubilee Labradoodles, the quality and health of our pups allows us to produce wonderful family companions. By continuing on the excellent care received in our care, your pet will lead a long and healthy life. Contact us today at 517-467-6811 for more information on our miniature and medium-sized labradoodles and goldendoodles!